Walt Disney in a publicity still from the 1930s. Walt Disney (December 5, 1901 – December 15, 1966) got his start in the animation industry in Kansas City. He went on to become the world’s most renowned animator and movie studio executive. After he moved to California, he founded The Walt Disney Company, which now has revenues of more than $30 billion. In 2009, The Walt Disney Company acquired Marvel Enterprises, America’ largest comic book publisher. Disney’s parents moved to Kansas City where he lived from 1911 through 1917. He returned to Kansas City on his own in 1919 and began working at Pesman-Rubin Art Center. He became close friends with a co-worker, Ub Iwerks, and in 1920, the pair decided to formed their own company, Iwerks-Disney Commercial Artists. Disney soon had to leave the new company to generate income working for the Kansas City Film Ad Company, and Iwerks shortly followed. During their tenure at the Kansas City Film Ad Company, the two young men became interested in animation. After learning the craft, Disney once again struck out on his own, forming Laugh-O-Gram Studio on the second floor of the McConahay Building at 1127 East 31st Street in Kansas City, Missouri. Laugh-O-Gram produced a number of animated short subjects that were popular in Kansas City, but the company did not produce enough revenue to stay out of bankruptcy. After the failure of Laugh-O-Gram, Disney left Kansas City for Hollywood, where he and his brother Roy Disney founded what would later become The Walt Disney Company. The Disney brothers quickly found distributors who were interested in their concepts and began recruiting employees from Kansas City. Disney triggered a great migration of Kansas City animators to Hollywood that included Ub Iwerks, Hugh Harmon, Rudolf Isling, Carman Maxwell, and Friz Freling. 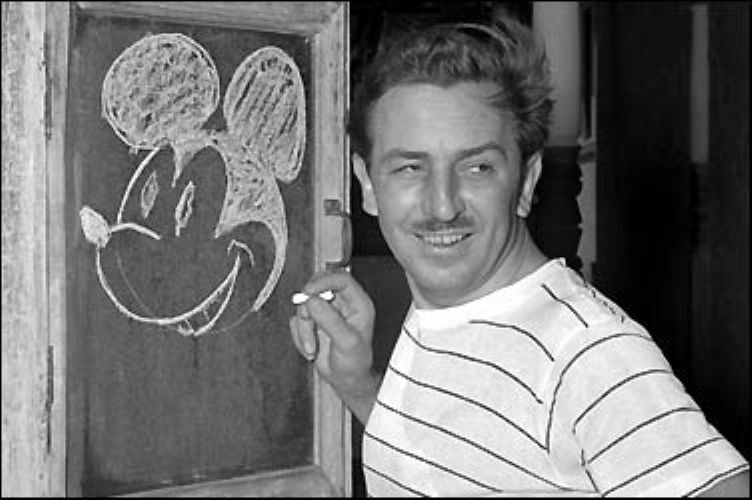 Walt Disney went on to create an animation and film studio that dominated 20th century movie animation. In 1932, Disney received his first Academy Award. He holds the record for most Academy Award nominations (59) and awards (22), plus four honorary Oscars. The Internet Movie Database features a comprehensive list of Walt Disney’s awards and nominations.